This has been the best suit of the year on my regular and small busted clients. It has a strap, but they did not show it in the photo. It comes with a hidden tummy-control panel, and has a sweet retro glam vibe. I am impressed with the “Profile” collection from Gottex and look forward to seeing more amazingly cut swimwear from this Israeli brand. Remember to size up at least one size. Also available in Amethyst and Lagoon. A nautical-themed cover-up. Fun! It’s a sweater style with a relaxed fit and an on trend high-low hemline. Sport it at the beach or pool, or use it for lounging at home or in the garden. 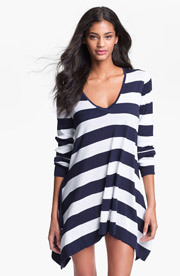 You could even wear it as a tunic over leggings, cigarette pants or straight leg jeans and shorts. Also available in a black & white stripe and in a peacock and white stripe. Tommy Bahama makes great quality beachwear. I love this white shirt because it can function as a cover-up at the beach or the pool, but looks sophisticated enough to wear as an actual tunic shirt too. Add a cami, and pair it with knee-length shorts, clamdiggers or cigarette pants. Tuck it into boyfriend jeans or slouchy trousers. Throw on a fab pair of sandals, loafers, sneakers or oxfords and you are good to go. Lightweight cotton with a subtle crinkle effect. You may need to size up. This swimsuit works especially well if you’re longer in the body and need extra bust support. The ombre effect is clever in that the darker bottom is especially camouflaging for extra midriff bits. Remember that swimsuit sizes in the US do not follow regular size specifications. You have to size up about two sizes. So if you usually wear a clothing size 6, you’ll need a size 10 bathing costume. This swim suit is genius. The centre front rushing and deep V-neckline elongate the body perfectly. Lots of structure plus you’ll feel pretty wearing the suit too. Remember that swimsuit sizes in the US do not follow regular size specifications. You have to size up about two sizes. So if you usually wear a clothing size 6, you’ll need a size 10 swimsuit. This suit runs a little short for tall ladies though so watch out if you have an extra long torso. Another fabulously flattering suit by Miracle suit. Great bust support, extra coverage and camouflaging ruching detail. Remember that swimsuit sizes in the US do not follow regular size specifications. You have to size up about two sizes. So if you usually wear a clothing size 6, you’ll need a size 10 swimsuit. This suit runs longer in the body so it’s great for tall gals and gals with extra long torsos. I didn’t expect this suit to look as good on the body as it does on the hanger, but it does. It’s very supportive and flattering to boot. Great weighty fabric, good coverage and just enough cleavage in the front and back to be alluring. Available in four colours, each of which are equally pretty. Remember that swimsuit sizes in the US do not follow regular size specifications. You have to size up about two sizes. So if you usually wear a clothing size 6, you’ll need a size 10 bathing costume. 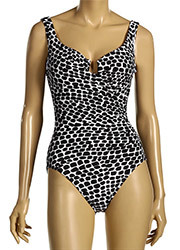 The “Sonatina” is still the best all round flattering one piece bathing costume available. I’ve had it on curvy hourglasses and athletic rectangles and the fit is very flattering – year after year. Just brilliant. The breast cups keep the bust line in place, while the ruching helps camouflage extra mid riff bits. The plunging neckline is alluring and elongating while the back is low, but not too low. Pop on a wrap, straw hat, thong sandals and you’re ready for a comfortable day by the pool or beach.